Heated Debate in Sociobiology: Is Hamilton’s Equation Wrong? In 1964, [W D Hamilton] submitted a pair of papers to the Journal of Theoretical Biology. The papers hinged on one simple equation: rB > C. Genes for altruism could evolve if the benefit (B) of an action exceeded the cost (C) to the individual once relatedness (r) was taken into account. 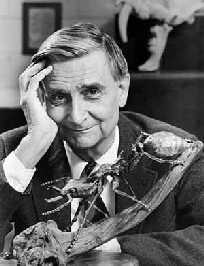 Hamilton referred to his model as “inclusive fitness theory.”…[A]n ambitious entomologist named E. O. Wilson read the paper. Wilson wanted to understand the altruism at work in ant colonies, and he became convinced that Hamilton had solved the problem. By the late nineteen-seventies, Hamilton’s work was featured prominently in textbooks; his original papers have become some of the most cited in evolutionary biology. …In an obituary published after Hamilton’s death, in 2000, the Oxford biologist Richard Dawkins referred to Hamilton as “the most distinguished Darwinian since Darwin.” But now, in an abrupt intellectual shift, Wilson says that his embrace of Hamilton’s equation was a serious scientific mistake. Wilson’s apostasy, which he lays out in a forthcoming book, “The Social Conquest of the Earth,” has set off a scientific furor. I described the Wilson et al paper in an earlier post.